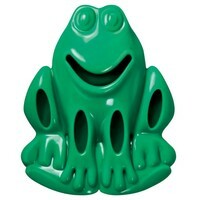 The Kong Quest Critter Frog is designed to keep your favourite pup playing for longer. It has a treat dispensing feature that will release treats as a reward while your dog chews and rolls the frog around. This fun, adorable toy will not only keep your dog entertained by stimulating their natural hunting behaviour but will also clean their teeth and massage their gums.